30th SEPT. 1915: CONVALESCENT CAMP ROUEN: ‘ON BOARDS UNDER CANVAS & BEARING CHEERFULLY’. 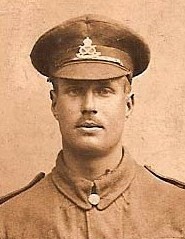 Pte BERTIE HIBBETT. No 6 GENERAL BASE CONVALESCENT CAMP. YMCA LETTER HEADING – On Active Service with THE BRITISH EXPEDITIONARY FORCE to Marie Neal Hibbett, 95 Foden Rd. Walsall. Written in ink. No 6 General Base. Thurs: Sep 30th/ 15. Yes, I slept well on Sunday night. I was in the Convalescent Camp & I had a bed in a hut or ward, but of course they were without white quilts & fancy blankets & no pillows, but I felt as comfortable, – & now I am on boards under canvas again – & I suppose I shall be on the ground as next stage. I received your parcel this morning. I walked across to the Hospital for it. I went to a service on Sunday evening in the C.C. (1) – but of course it was not quite so nice as the pretty Church Tent in Hospital. The eggs have come safely, but this time the box seems to have had the worst of the journey, the paper almost off & the lid crooked. Dearest Mummy I don’t think I shall need so many parcels, you have sent them on top of one another lately, but now that I am out of Hospital & can draw my pay & able to go to the Canteens, I might be able to get some freshly boiled eggs in a morning. I will tell you if I do. Last night I went to an amateur play of Henry Vth in YMCA – was that Basil’s play (2) ? The enclosure of that envelope you sent was from Mr Bates*; he is in the Inns of Court OTC & is going in for a Commission. I am keeping well & happy & I’m trying to take things as a matter of course. Hoping Sydney will have a safe & happy journey (home). I am sending a letter to Harold. Trusting you are all keeping well & ‘bearing cheerfully’ as McKenna sais of the Budget (3). (3) Reginald McKenna, 1863-1943. Chancellor of Exchequer. Third War Budget 25th Sept 1915. Introduced ‘Mckenna Duties’ : import duties, 50% excess-profit tax & 40% personal income tax to sustain the War effort (a temporary measure which lasted 41 years until 1956). As First Lord of Admiralty, 1901, McKenna pressed for the building of battleships over social reform. First of 18 ‘dreadnoughts’ begun in 1911 gave British advantage against Germany at beginning of WW1. Chairman of Midland Bank 1919-1943. Wikipedia. 30th Sept. Thur: Many dug-outs demolished & much damage to rifles and equipment but no casualties. Between 3.0 pm and 5.30 pm enemy fired 16 ‘crumps’ (4) on to dug-outs and woods behind trenches 34 & 35. Enemy commenced heavy bombardment of 33 & 34 supports and dug-outs in wood, which lasted until 9.30 pm. ‘B’ Company went up to support trenches behind 33 & 34, one platoon manning 33 fire trench. CASUALTIES: KILLED: 7931 Coy S Major Harris A.T.. WOUNDED: 8160 Dr. F Charless; 8169 Pte S.J. Holmes; 8147 Corpl. W.J. Mallaband ; 7577 Corpl. W. Pearce. WOUNDED (shock) 8343 Pte V. Hackett; 9041 Pte S. Dance; 4817 Sgt W. Hawkins. 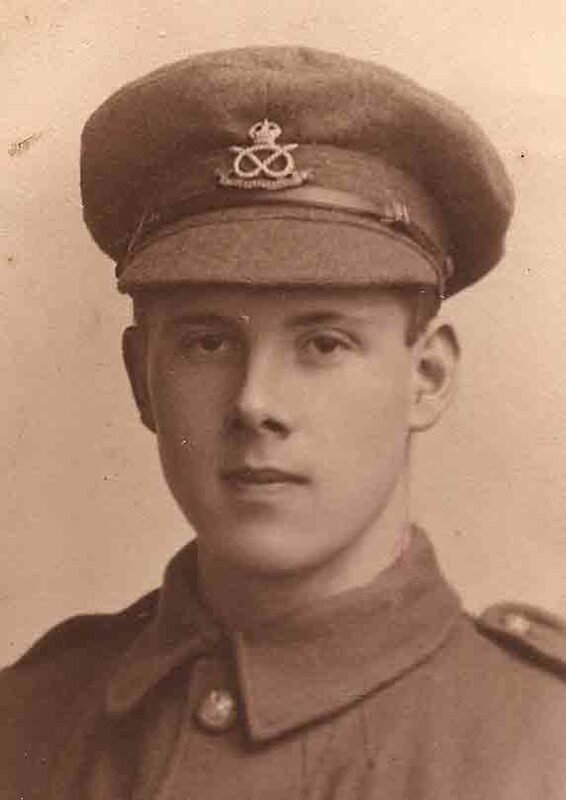 SLIGHTLY WOUNDED (remain at duty) 8309 Pte R.J. Williams. SEPTEMBER TOTAL: KILLED 3; WOUNDED 25; SLIGHTLY WOUNDED (remain at duty) 15; DIED OF WOUNDS 2. Signed: Richmond RAYMER Lt Col. Commdg 1/5th South Staffordshire Regiment. NEXT POST: 2ND OCT. 1915. Army PayChairman Midland Bank.Church Tent.Convalescent Camp Rouen. 1915.Crumps.Dreadnought Battleship.Inns of Court OTC.McKenna Duties.Railway Dugouts Zillebeke 1915.Reginald McKenna.Third War Budget 1915.YMCA Henry Vth Play Rouen. Pte BERTIE HIBBETT, No 6 GENERAL BASE CONVALESCENT CAMP: YMCA POSTCARD to ARTHUR HIBBETT Esq. 95 Foden Rd. Walsall. Censor No 920. YMCA Postcard 28th Sept. not franked until 1st Oct. 1915. No 6 General Base. Tues: Sep 28/ 15. Was transferred from the Convalescent Camp on Monday evening (1) & am now back at my Base; where I am put on light duty for three days & then I expect I shall be sent to my unit for Active Service & hope I shall soon be ‘up & at it again’ singeing the K____’s whiskers. (2). ‘ARF A MO KAISER!’ BERT THOMAS’ CARTOON. Copy by A.H. Hibbett. 1914/ 1915. Good news in the papers isn’t it? (3). I am quite well. The Weekly Dispatch (British Newspaper estab. 1801) became ‘Sunday Dispatch’ in 1928 until merged with Sunday Express in 1961. (3) Newspapers were quick to report initial success of the Battle of Loos (pronounced ‘Loss’), Hohenzollern Redoubt, on 25th Sept. 1915, part of the major attempt to break the trench stalemate along the Western Front. 26th & 27th Sept. In Brigade Reserve. CASUALTY: WOUNDED 27th inst. 8715 Cpl. R.J. Drew. 28th & 29th Sept: Dug-outs shelled from 11 am to 1 p.m. with 8 in. armour-piercing shells and H.E. shrapnel. NEXT POST: 30th SEPT. 1915. 'Arf a Mo Kaiser!' Bert Thomas Cartoon.Armour-piercing shells 1915.Battle of Loos. 1915.Convalescent Camp Rouen. 1915.No 6 General Base Rouen. 1915.Railway Dugouts Zillebeke.The Weekly Dispatch 1915. 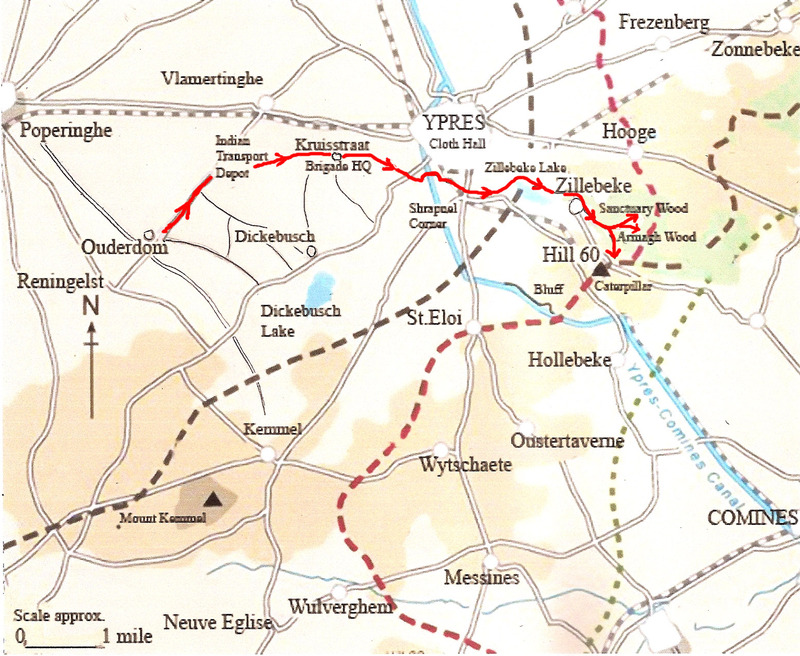 25TH SEPT.1915: OPERATION ORDERS: THE 2ND ARMY WILL ATTACK EAST OF YPRES. S. W. SLOPE OF HILL 60. 25th Sept. Sat: See Operation Orders d/24.9.15. 1. Allied Forces on the Western Front are taking offensive on the 25th inst. 2. The 2nd Army will attack E. of Ypres . . .
(a) Enemy salients in I. 29, 30 and 34 and his approaches to them will be kept under artillery, rifle fire, and machine gun fire, special attention being paid to suspected observation posts. The targets for the 137th Brigade being these points in front of the Brigade Trenches, rifle fire will be from loopholes or sniperscopes. (b) If the wind is favourable a curtain of smoke will be directed on HILL 60 and the CATERPILLAR from the trenches of the Left Sector, 137th Brigade. 5. Watches will be synchronised from Battalion Headquarters at 12.30 A.M. Sept 25/ 15. 6. During the Artillery Bombardment that is :- up to 4.20 A.M. men in the trenches except sentries will be kept under cover immediately bombardment ceases, that is:- 4.20 A.M. rifle fire and machine gun fire will be opened on the enemy trenches as directed in para 4 (a). 7. Battalion Head Quarters will be established in the Strong Point in the Wood at 10.30 pm Sept 24th communications with Head Quarters are to be tested every quarter of an hour from that time onwards. 8. Casualties will be accommodated in the most convenient dug-out and if necessary, medical aid will be obtained from Battalion Head Quarters. J. LAMOND, Capt. & Adjt. 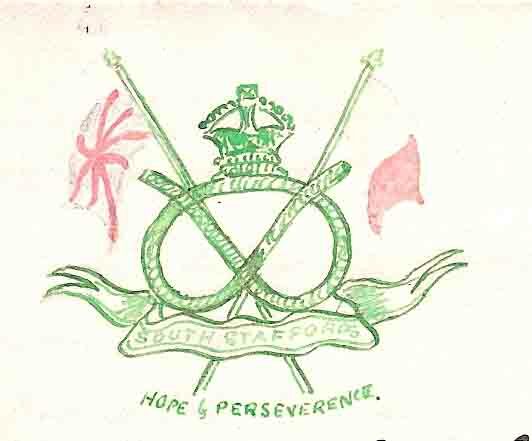 1/5th Bn South Staffordshire Regt. Issued at 1.30 pm. Pte Bertie Hibbett was expecting to move from Hospital to Convalescent Camp on Sat. 25th Sept. The fact that a major offensive along the Western Front had begun would have been known in Rouen by that evening. But Bertie would not have known what was happening to 1/5th Bn. South Staffs on Hill 60 Ypres Salient – and he would have been anxious for the safety of his brother. In the event, as the following record shows, the 1/5th South Staffords cooperated as ordered; their Brigade Head Quarters in the Wood was not damaged and their casualties were comparatively slight. Elsewhere the story was very different. On 25th Sept. the Battle of Loos (pronounced ‘Loss’) witnessed the first use of chlorine poison gas by the British and led to the gassing of 2,632 of their own men. Initial success that day came to nothing, through lack of Reserves. The fight for Loos and the Hohenzollern Redoubt was to continue for many weeks with many losses. S. W. SLOPE HILL 60. 25th Sept Sat: During early morning Enemy shrapnelled 36 Trench with H.E. – also fired single shells at intervals into the Wood without effect. Trench mortar opposite 35 silenced by Belgian Battery. Enemy trenches opposite 35 & 36 bombed and rifle grenaded. Enemy trench-mortared 33 in reply until silenced by Belgian gun. CASUALTIES: WOUNDED: 8534 Pte L. Lyons. SLIGHTLY WOUNDED (remain at duty): 8246 Pte L. Abel; 8454 Pte S Goode; 8708 Pte W. Selby. NEXT POST: 28TH SEPT. 1915. 137th Brigade 1915.Artillery Bombardment.Battle of Loos. 1915.Belgian Battery.Chlorine Poison Gas.Hill 60 and Caterpillar. 1915.Hohenzollern Redoubt 1915.Smoke Screen 1915.Sniperscopes. 24TH SEPT. 1915: OPERATION ORDERS: ALLIED FORCES ON WESTERN FRONT TAKING OFFENSIVE 25TH INST. Pte BERTIE HIBBETT: No 9 GENERAL HOSPITAL, ROUEN: O.H.M.S. 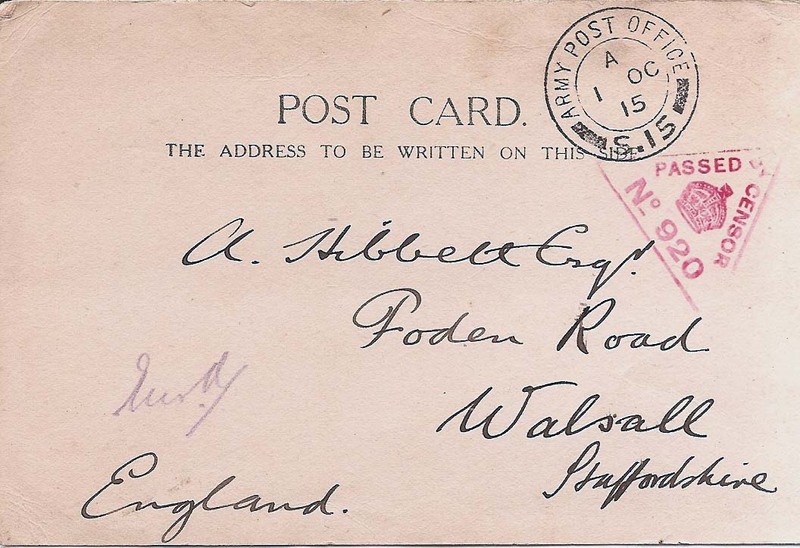 POSTCARD to Arthur & Marie Neal Hibbett, 95, Foden Rd. Walsall. Have been marked for the Convalescent Camp today by Major. Shall in all probability move from Hospital tomorrow. Since I received your welcome parcel & letters I have been dealing with the matter with regard to Father’s request. Very little hope so far. Will let you know something more tangible about affairs when possible. Had welcome letter from Sydney yesterday, sais he has his name down for Leave. Hoping you all will see at least one of us before the Winter. Sent you a PC on 22nd. I remain, Your affec. son, Bertie. Pte Bertie Hibbett and his Family must have been aware of rumours, circulating in the UK since June, of a major offensive planned for the Western Front. This would account for the heightened anxieties in recent Letters Home regarding the possibility of a ‘Blighty‘ for himself and Home Leave for his brother. With the move from Hospital to Rouen Convalescent Camp Pte Bertie accepted he must soon join his Unit and do his duty to his country. We have seen that he hoped against hope that his sense of a ‘higher calling‘ meant he had a future – that he would survive this campaign. 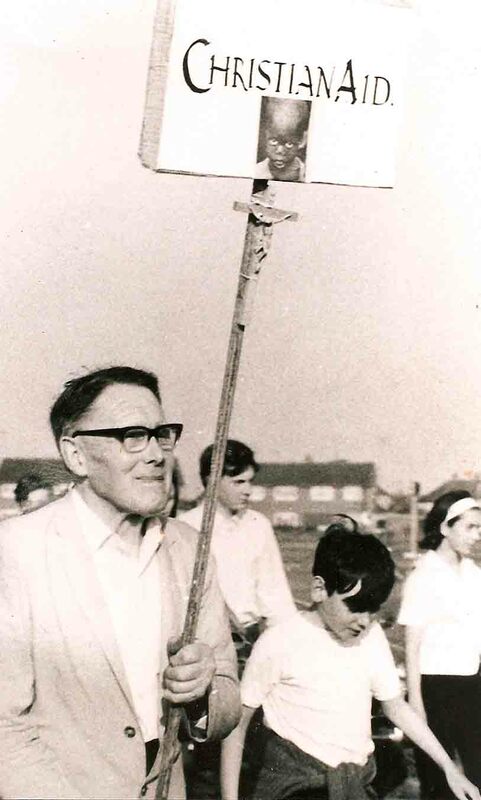 My father’s heading: ‘I am quite well’ and ‘Friday night’ indicates he knew a ‘Big Push‘ was absolutely imminent. He would not of course have known the details (below) of the 2nd Army Operation Orders for 137th Brigade (signed at 1.30 pm that day) – that it was to act as distraction from assaults elsewhere and that 1/5th South Staffs Infantry were to remain under cover on Hill 60, hopefully behind a smoke screen and firing through loopholes and sniperscopes. Pte Bertie would not have known the whereabouts of his brother. by Lt Col. R.R. RAYMER Commdg. 1/5th BATTALION, SOUTH STAFFORDSHIRE REGIMENT. 24. 9. 15. 1. Allied Forces on the Western Front are taking offensive on the 25th inst. 2. The 2nd Army will attack E. of Ypres. 3. The 3rd Division are to attack on the front J.13. c. 8.0. to I.12. c. 9. and the 14th Division on their left. The final artillery bombardment will commence at 3.00 A.M. and the Infantry will assault at 4.00 A.M.
J. LAMOND, Capt. & Adjt. 1/5th Bn South Staffordshire Regt. Copy No.1. To O.C. A. Coy by Orderly. No. 2. To O.C. B. Coy by Orderly. No. 3. To O.C. C. Coy by Orderly. No. 4. To O.C. D. Coy by Orderly. No. 5. To Machine Gun Officer. No. 6. To Bomb & Signal Officer. No. 7. To Medical Officer. No. 8. To War Diary. 20th – 24th Sept. 1915. SW SLOPE OF HILL 60. 20th Sept. Mon: Enemy fired one trench mortar at 35, no damage. Very quiet day. 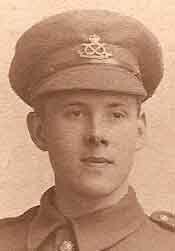 CASUALTY: WOUNDED: 9512 Pte G. Wooldridge; 9123 Pte W. McNeil (slightly wounded remain at duty). 21st Sept. Tue: Patrols sent out from 34 and 36 found nothing unusual. Aeroplanes very active. Enemy’s front line opposite 33 and 35 rifle grenaded, no retaliation. 22nd Sept. Wed: Trench opposite 33 again rifle grenaded without reply. Exceedingly quiet night. 23 rd Sept.Thur: 4th Belgian Battery damaged parapet opposite 34. Rifles fixed on the gaps and fire maintained during the night. Trench opposite 35 bombed at 2.20, 3.15 and 4.45 am. retaliation one trench mortar shell. Our artillery bombarded trenches opposite 33 and 34 from 12.5 pm to 12.50 pm. At 9.30 pm enemy exploded mine outside 33 trench. No 1 Bay blown in crater just clear of our parapet. Force of explosion largely dissipated by 139th Brigade sap, and slope of Ravine. Another smaller crater since observed, about 30 x south of large crater and midway between the lines. Trench opposite was observed to be packed with enemy, rapid fire opened at once from all available rifles. Two Germans who exposed themselves were shot. CASUALTY: WOUNDED: 9346 L/ Cpl A. Danks. (slightly wounded remain at duty). 24th Sept. Fri: Very quiet day. Enemy trench-mortared 33 and 34 after dusk. No damage. 'Big Push' Sept 1915.2nd Army Operation Orders Sept 1915.Hill 60.Smoke Screen.Sniperscopes. 19th SEPT.1915. ‘SUCH A COLOSSAL STATE OF CONFUSION’. Pte BERTIE HIBBETT, No 9 GENERAL HOSPITAL ROUEN: LETTER to MOTHER, Marie Neal HIBBETT, 95 Foden Rd. Walsall. ‘O prosper thou our handywork’ (sic). Psalm 90. Beginnings. I’ve missed out the ‘very’ & was thinking of beginning afresh, but then it would be waste so you will forgive me won’t you Mum. Now I have got a lot to say and didn’t know which end to begin so I’ve adopted little headings. I do like to make a good start to a letter. A Striking Coincidence. Oh Mum you have begun your letters of late capitally. Your last two did thrill me, especially the long one enclosed in the last parcel. What a queer thrill went through me when I read that you were thinking about us both in the garden in the sunshine. Now it is natural that both sides should be thinking of one another, but after me writing last Sunday afternoon just when you were thinking about us & me writing about the fact too & then to hear from you in writing. It was indeed a striking coincidence. I’ve just sharpened my pencil & popped the last of your Nestle’s chocs: in me mooth (1) – no more details now, you’ll understand I guess. I have your letter in my hand. Well Mum I should like to say I’m TOP HOLE – but will put it that I am happy & grateful at present. A Victory. I was going to begin my letter dramatically & shout Hurrah! – for I managed to coax round the cook & get three apples roasted on the day I got your last parcel. ( Oh! I say to me sen, I’ve let the cat out of the bag. I wrote to Mr Darling* yesterday & had to start twice, the first attempt was on this sheet and I haven’t a rubber to let the cat in the bag again (2). Parcels. Yes Mum I’ve had both parcels all right, the one addressed to the Base came up without fail. I don’t think there is any harm in hard boiled eggs, I think they have done me good, having had no signs of further illness through eating them. I guess they are dear in Blighty now. Lissie’s* Toy Gun. I had a parcel from Okoo when I got yours as well. How the patients eyed me with envy carrying the parcel post away again. I opened your parcel 1st & found the treasure Dodger told me to look out for, Lissie’s gun. I sent her a card & she will get it today & you will have got my F.P.C. It was too bad of you to send another bit of cash. I tried to get some of the apples roasted, but I was late at the cookhouse. The cook hadn’t got the ovens going then. Then I opened Harold’s parcel after reading your letter. Mummy’s Photo. . . Oh! Mummy! Let me see you again. How lovely you look, your light hair in contrast with Miss Bore’s and the pretty frill. Hibbett Family under the Bridge at Whitby. 1915. From Left: Basil, Hilda Bore, Mother & Father. (Photo Harold). I see you are busy with your ‘fissies’ as usual – (tissies) as Basil called them (1). Yes! I have looked closely & well I never! its a pair of socks you are knitting & very likely the ones I’ve been wearing. Oh! you are nearer to me now Mummy – & you felt so near to me all day Thursday that I almost saw you by my side. I know you are thinking of Sydney & me again, but I trust you are thinking happily. Sister’s Address. A very nice letter indeed & I was in raptures when I read near the conclusion & went to read that little bit to the Irish Sister & showed her your photo Harold sent. When she heard of such a generous exclamation as ‘Bless all those who are kind’ to Sydney & me, and that you would send a little present, – guess what she said – she said it quite naturally, not as if she was posing & aware that I should write down her words – ‘What a nice kind Mother she must be’. She was delighted with the photos; she knew Whitby & had a sister who had been there & seen the old bridge, underneath which you were taken, & the old houses on the cliff. She gave me her name so that if you wish to keep to your generous promise, dear Mum, you can send a little present to Miss M.E. Boyd*, No 9 General Hospital B.E.F. – that is enough to find her. All the Sisters are right for their work & take things lightheartedly, amusing the patients & asking them how they are getting on. 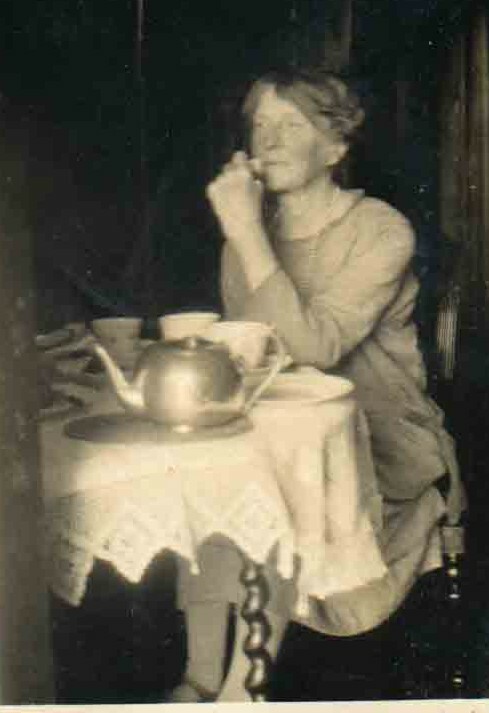 But this Irish Sister, who I have said reminds me of Winnie Overend*, often gives us cigs & sweets, which I believe she buys out of her own pocket. The other dark-haired Irish Sister is always prodding into me when she sees me writing. (She is going to give me some cigs; she interfered with my writing again jokingly & I showed her your photo which she greatly admired – & then promised me some cigs this afternoon). Miss Foster. I wrote to Miss Foster on Thursday, in time for the letter to reach her on her birthday yesterday. This sister picked up my letter when I showed her my drawing of a patient in Hospital Dress & she just glanced at the introduction. How she larfed. ‘No it isn’t’, I said as she expressed the idea that it was my fiancee. I thought I would draw something for Miss Foster, not being able to give her anything more than a letter, but as I was half way through a newsboy came to the Ward door & instead of buying a paper I bought a Souvenir Card he tempted me with. I put some of Ida’s W.H. scent on it & enclosed it in Miss Foster’s Birthday letter. Dr Hibbert (3). Now here’s another funny coincidence – during yesterday I came across a patient who had been to Nottingham Goose fair every year & never missed up till the War. He was a Lincolnshire lad who knew all about Uffington (4) too – the conversation started with reference to mushrooms. Another patient I came across was in the Royal Scots Greys & came from York. By the by, these acquaintances remind me of Ida at Leicester Hospital. The Head Sister of the two Wards said once when she was giving me medicine, ‘Call for your medicine Hibbett – let’s see – I know a Hibbert, I have a friend related to a Dr Hibbert’. That’s the limit – now on to something more serious. Besides the photos of you all at Whitby there was one of Harold. Who took it? I must congratulate the photographer for it is very artistically arranged, but Oh dear Okoo, why isn’t there a smile, eh. Kaiser Wilhelm II. Last German Emperor & King of Prussia. 1859 -1941. The Marriage. I say Mummy, & all of you at home, wouldn’t it sound nice to read & hear of a Lieut. 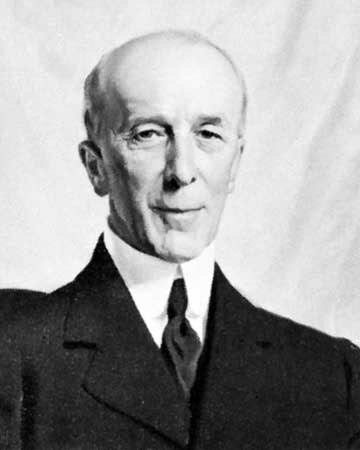 Harold Victor Hibbett R.A.M.C. will be married shortly to Miss H.B. eh. what oh! & to hear that his brother, Mr. A. Hibbett’s second son, who is fighting at the Front will act as best man. Best Man. Oh Sydney! how can we buck up & ‘singe his whiskers’ (5). How can we bring such a colossal state of upheaval to a close – & get Home to witness a fine bust up at Home, Sweet Home. Boils. Now, Mum, that leads me to tell you the answer to your anxious enquiry. Yes, I will let you know all in this my (next) letter. I daresay you were disappointed in all the letters you’ve had since the 12th thinking I should answer your queries in them. I don’t think for a moment now that I could get Home through my complaint for I am quite better now; the ‘excavation’ into my neck has been finished with & the ‘cavity’ is practically closed up now. Home Sweet Home. I was expecting to be marked out (6) today, but the Doctor said I should be in tomorrow, Monday. The Doctor was very amiable & knows his business, but I do not think he could do anything to send me Home & I know it is of no use whatever to try & put the matter to the Colonel. You see there are many more cases & some are worse than mine & too there have been many cases such as mine & they have been able to put them right enough for Active Service. Blighty, My Little Grey Home in the West. No, I don’t think Dad could do anything; it is all very well for Sydney to say what he has said to you & I’m grateful to him at the same time. I believe the great majority of patients want to go to Home Sweet Home – Blighty as we call it. Dining Hall Talk. It is ‘Dining Hall talk’ on how chaps are favoured & work their ticket marvellously & that it is one in 1000 who want to go up the line again. The Three Calls. But oh Mum I have told Mr Darling* that I feel I am on the balance in Hospital here. I can hear three calls. I can hear Sydney calling me (seems funny, although he doesn’t wish me to join him). I can hear the call of Duty. ‘Rise! fellow-men, our country yet remains, By that dread name we wave the sword on high & swear for Her to live, for Her to die’ (7). At Duty’s Call. My New Calling. Ready Aye ready. The third call comes indirectly through Hopes of living through the campaign & taking up a new career. His calling, that came to me through Bishop’s Stafford’s text for the confirmation candidates of 1911. ‘Blessed is the man whom thou choosest & receivest unto thee. Here am I – send me.’ (8). My Little Khaki Case. Another look at you dear Mum. I have scented you with Ida’s White Heather Scent. Mother it reminds me of the lovely scent you had on you. I have scented the case. And there’s ‘Crippen’ Mummy – oh don’t say that of dear Dad, but it’s a joke eh Mum, ‘Hoo Hic! ain’t he strict.’ (9). Thinking. Another look at Mum. Yes you are thinking of me & I of you. I wonder if you are peeping at Sydney too & my photo. Today’s Post. I had a letter from Cousin Stanley* this morning. My word what a change in style and manner, – of course he is 17. He seems to have grown out of his shyness by the way he writes. And I have had a nice, delightful, little letter from Miss Jones* & Miss Humphries*. . . There was to be a box of cigs with the letter but I have not had it yet, perhaps it will turn up tomorrow. Miss Humphries says rightly, ‘The Lord is the same yesterday, today & forever’ (10). Keep Looking Up. There is a happy thought to conclude with. Keep looking up, it is a bright blue sky & the sun is ‘nearing’ the West where you are. Let your two sons push forward to the East & singe his whiskers, as Harold said, & do our Dooty, as England expected in Nelson’s day, & ought to now, & does now (11). God bless you dear Mother, my very dear Mother & the same to my Father. I do love him whom Ida once said is ‘kindness itself’ – she knows. Best love to all, from Bertie. Church of England’s Soldiers’ Institute, London.1915. Post Script. Another Victory. Of course you must always expect a Post Script. I have been unable to obtain any milk or eggs, but I should think I shall be at the Base before this week is out & then I shall be able to get some eggs. But you must understand that we have not the conveniences like at Home. Men won’t be troubled with boiling milk & eggs for me or anyone else. But I managed by coaxing the chap at the Soldier’s Institute Canteen to make a bowl of coffee with the coffee you sent me in the parcel & it was ripping with those digestive biscuits & I enjoyed a good little supper that night (last night). I wondered whatever to do with that coffee. The shirt will come in useful when I am out of Hospital but you need not send me another as I have lately been given a new outfit & Sydney could do with them. Hoping I have satisfied your queries. I have not said all yet. I wonder if I was thinking of you before you were thinking of me today when I went to Holy Communion in the same lovely little tent. It is a lovely evening again & I am going to Church, are you? Pte Bertie Hibbett’s longest letter yet in which his little headings help him to sort out his own confusion between Three Calls: Duty to his Brother, Duty to his Country and Duty to God. (1) Hibbett Family Jargon/ Slang: mooth–mouth; sen–self; ‘cat out of the bag‘ –let out a secret by accident; fissies (Yiddish for ‘feet‘) – hence knitted socks; Hoo Hic– nonsense words; dooty-duty. NB. ‘Okoo’ & ‘Dodger’: nicknames for Basil Hibbett, Bertie’s youngest brother. (2) Bertie has written ‘Saturday Sep 18/15 ‘Dear Sir’ along the side of paper). (3) The Hibbett Family was proud to differentiate itself from the ‘Hibbert‘ descendants of the Ibbot Family. Spelling: from my (6 x great) grandfather John Ibbot b. 1690; William Hibbett/or William Ibbot b. 1735; Luke Hibbitt b. 1765; William Hibbett b. circa 1790; Henry Hibbett b. 1824 (my great grandfather of Rutland & York); Arthur Hibbett b.1860 (my grandfather); Arthur Hubert Hibbett. b.1895 (my father). Sydney Martin Hibbett b. 1931 (my brother). NB Observant folk will notice the number of years between father & eldest son is mostly 35 years. (4) Uffington: Lincolnshire home of Hibbett cousins. (5) ‘Singe his (Kaiser Wilhelm II’s) whiskers‘: get close enough to defeat him. Found in WW1 soldier’s story. (6) ‘Marked Out’ (by R.A.M.C. ): to be sent back to the Front Line. (7)’Rise fellow men. . . ‘Wanderings of Childe Harold’: John Harman Bedford, Lieut. R.N. ‘A Romance of Real Life’ (Lord Byron). 3 vols. 1825. London. (8) Bertie has conflated two biblical sayings on God’s calling: ‘Blessed is the man…’ Psalm 65.4. ‘Here am I send me‘: First Isaiah 6.8. (9) Dr. Hawley Harvey Crippen: American homeopath murdered his wife/ first criminal to be caught by wireless telegraph. Executed Pentonville Prison, 1910. Family nickname for Dad (Arthur Hibbett) when strict. (10) ‘The Lord is the same. . .’ Hebrews 13.8. 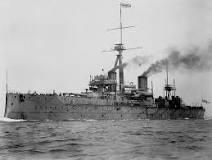 (11) ‘England expects that everyman will do his duty. . .’ Signal sent by Vice Admiral Horatio Nelson from flagship H.M.S. Victory 21st Oct 1805, Battle of Trafalgar. Napoleonic Wars. Lance Corp. SYDNEY HIBBETT & 1/5th SOUTH STAFFORDS WAR DIARY. Rough Map of Staffords’ Route to the Front. 5th July 1915, showing Dickebusch & Hill 60. 18th Sept Sat: Divisional Reserve. Relieved the 6th North Staff in the trenches. 19th Sept. Sun: S.W. SLOPE HILL 60. Very quiet day. Aeroplanes active on both sides, our machines appeared to have the upper hand. NEXT POST: 24th SEPT. 1915. 'Blighty'.Boils.Canada Huts Dickebusch.Crippen.Family Photos.Horatio Nelson.Isaiah 6.8.Little Grey Home in the West.Little Khaki Case.Miss M.E. Boyd.Nottingham Goose Fair.Psalm 65.4.Psalm 90.R.A.M.C.S.W. Slope Hill 60 Ypres Salient.Soldiers Institute London.Uffington.Whitby.White Heather Scent. Pte BERTIE HIBBETT, No 9 GENERAL HOSPITAL, ROUEN: LETTER to HIBBETT FAMILY 95 Foden Rd. Walsall. I wonder who Dad will give this letter to? Will he read it himself first? Let me know if you have got this letter by return of PC. Just eaten one of those many apples which smelt as good as it tasted, and then I set to work re-reading all the letters I’ve had from Sweet Home since I sent my last green to Mum, taking notes as I re-read them for the 2nd, 3rd and 4th time, as I could not hold all of them in front of me to refer to, especially Ida’s long scroll of the Committee’s parchment (3), and also Basil’s many sheeted epistle . Now I promised this letter to be plain, short & serious, but how ever can I! I have had something from the post every day I have been in Hospital since the 10th when I got Mum’s letter of the 5th (Sun) – the record coming to a climax today & yesterday when I got Ida’s letter including Mum’s off the sheet & Basil’s & one from Cousin Muriel; she can write well both in hand & in grammar. The final – The Limit came today when I opened your other hamper of good stuff. Dodger, you said Lissie (4) had brought you something from Venables*, were they the delicious cheese tarts? – and Mum you didn’t finish your letter either – I’ve caught you this time, Ha hee. Did Basil get his letter I enclosed in the green to Mum & Dad? I really thought I had thanked you for all. I’m sorry, very, if I did not say I got a bit of cash – which came in useful, as I missed pay day again, coming here on the Tuesday. Now Dodger your description of Home was simply delightful to read & you’ll be surprised that I did not sentimentally faint, to long all that much to come Home. I hope you will not look at that in the wrong light – what I’ve just said – especially Mum. Yes I can picture you now Dodger coming down stairs after washing off the smoky grime of the journey. How miserable too the journey for you must have been, but I was so very pleased you loved the sight of Home again. I am human & sometimes long to come Home & I think Ida will agree with me that if I give myself to that feeling & did not try to master that longing & check it I should not live happily out here. I say I made short notes but it looks as though this letter will persist in great length, try how I might. Did Ida & Mum read Dodger’s letter before he sent it off? Ida ought to be proud that Basil loved to meet her at the station. Ida is a genuine Champion for advice, & if she could not see her way to give advice she would show wisdom. I mean she will help Dodger to pass his exam next time & she has bucked me up a lot too, I could say more on this but must stop. No: I must just say one word more. I am cross at Ida for not taking notice of what I said in my green to her – & Mummy I cannot let you off lightly ’cos I know you would get to know all – as for myself I put all the blame on my rascally pate. I do feel a hypocrite, yes Ida there are worse cases than mine, & I ought to have trusted that you would know my case was not all bluff (for they do not send anyone to Hospital for nothing) without me saying even a word . Oh I am sorry Mummy I have made you all more anxious, it was not at all my intention, but my intention has been all along to make you happier. Sydney, I have no doubt would have ‘scolded & reproached’ me dreadfully & rightly too I now think. Just a touch upon light trivials:- I have mentioned the same Winnie unconsciously of Basil’s thought (you can tell by the time the letters were written). This Irish Sister laughs just like Winifred Overend Yes Ida is a Champion with a knack of putting one right, & that put me in mind that Basil too becomes his nickname nicely when I read of his whimsical dodge at catching bunny rabbits on his record tramp to R.N.B. (5). Now will that do for Dodger. I will just wish him the best of luck in his next attempt. Is he going to school again? I hope so. QMS I suppose. Now for Mummy, as I read yours next I will say my say. Yes I will try & cuddle round the cook to get me some of your nice apples roasted & will tell you if I succeed. I will not miss out thanking you for every article in the parcel this time, starting with the welcome bit of cash. I have not unwrapped it yet, but put it in my purse straight away. I will keep to your advice Mum & buy, if I can get, milk, eggs & fruit. I am sure of the last, but not so sure about the eggs because I am not at the Base & eggs are nowhere to be found to buy here. As for the milk there is only tinned milk here, if none at all & if I am out of the Hospital tomorrow the only liquid milk obtainable is at YMCA & that is Horlicks Malted Milk. At any rate I will try my best to spend it wisely & think of Mummy as it dwindles down to a penny & then to a sou. With regard to Sydney’s Com: I say what Mum sais, you seemed to want us both to be officers, but if you think, as no doubt what you say is true, we shall likely be parted, then I say Down with the idea. Down with it. 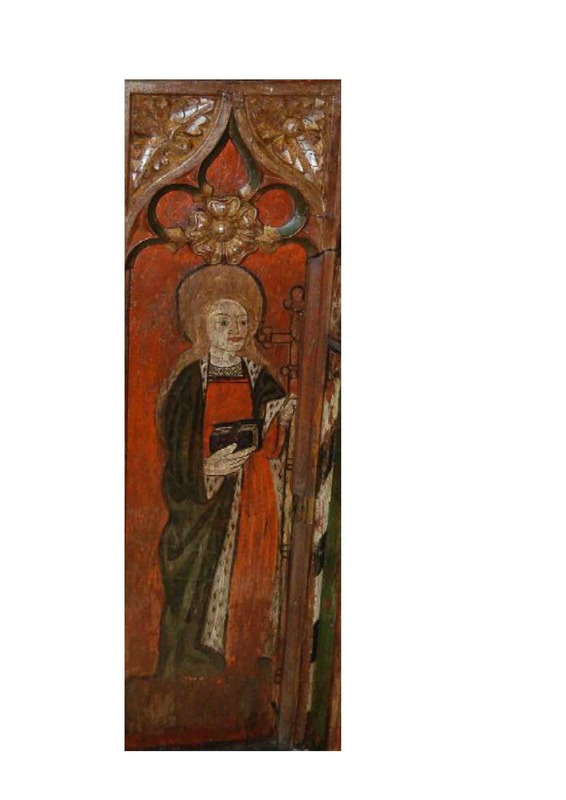 St Helena: Medieval Roodscreen Painting. Combe Martin, Devon. Eddie Sinclair Conservator. 2013. I am quite well now Mummy & am happy, so you will be too in the future won’t you Mum? I do feel a hypocrite when I am in my deck chair among the flowers & think of Sydney up there. How can I reconcile for what I have said & the consequences in the way of making you anxious again. I pray twice a day for you Mum. So let us both ‘Look up’ again. I am writing straight away again you see for your kind things & will tell you how I enjoyed my tea with apricots, cream, sugar & cheese tarts. I will reserve one for supper, & will make the parcel last out. I am looking forward to the other part of the hamper & you will naturally have another letter from me but let me keep . . . . .
(1) Holy Cross Day: Feast Day of Veneration of the Cross of Christ. St Helena of Constantinople 250 -330 AD. Patron Saint of Archeologists is reputed to have discovered the true Cross in Jerusalem. Mother of first Christian Roman Emperor Constantine (‘In hoc signo vinces – by this sign I will conquer’). The Revd A.H. Hibbett. Sponsored walk, Burgh to Skegness, Lincolnshire. 1967. One of Dad’s favourite hymns: ‘Lift High the Cross’ 1887. Words: George Kitchin, Dean of Winchester. Revised 1916 by Michael R. Newbolt. Hymns Ancient & Modern. (2) Basil, Ida & Mother. (3) Education Committee paper from Arthur Hibbett’s office? (4) Lissie: Arthur Venables* little sister? (5) R.N.B. : ? 14th Sept. Tue: CANADA HITS NR DICKEBUSCH. Divisional Reserve. NEXT POST: 19th Sept 1915. Commission.Eddie Sinclair Conservator.George Kitchin Dean of Winchester.Green Envelope.Home Sweet Home.Horlicks Malted Milk.Medieval Roodscreen Combe Martin Devon.Michael R. Newbolt.Q.M.S.Rouen N 9 Hospital 1915.St Helena of Constantinople.YMCA. 13th SEPT. 1915: ‘ITS ONLY THE TIE OF FAMILY LOVE I WANT REALLY’. I am indeed making the most of my time in Hospital. I have written no less than eight letters, including Ida, & Harold & there’s Sydney’s too, besides Miss Molly Evans, Mrs Hurst* & Her Ladyship Mrs Jones* & to make the list complete I must write to Mum, that’s one reason why I wrote last Friday. Whatever the others say Mum, I say it is a Rest to write to Mummy and I think Mum will sympathise with me & be happy at the thought of her very affectionate son, Bertie. PS Of course I must have a Post Script else the letter ain’t complete. Now I don’t expect a long letter from Mum, although I have had comparatively long epistles which have surprised me as well as pleased me . So I enclose the size of the letter you need to send me next if you wish. It is from the Writing Pad in the Lucky Bag I chose from the bundle sent from Ireland (1). I enclose too some cuttings from John Bull, my word ain’t it tolerant. It does use strong views. But I quite see in the article about ‘Blood will out’. I remember Capt Tim Cozens*, so popular with the Tommies getting quite a crowd around him & he said he loved a charge. It was when he told us about the knut leading the charge dressed practically in mufti (2). The article also puts me in mind of the Lancashire lads you know Mum (3). Ta ta. PS Sorry I am not in a hurry about a letter – its only the tie of family love I want really. So (if) you are busy, forgive me for insinuating. I expect I shall get your long letter tomorrow, but I will send this off tonight at any rate. Kind regards to Woody – safe journey back to Hospital I hope (4). NB Pickwick Club (5) reminds me – Snodgrass (6) had a letter from May (7). I hope Capt Flo* is a good help to Sydney getting a Commission. Something for you to fathom about in your spare time – I like letters which last a long time for you to read. Isn’t Mrs. Hurst jolly good, I enclose her letter. Thank you Mother for the magazine. It goes without saying that I enjoyed the perusal so to speak eh what! Sorry Mrs Hurst’s letter must be in the incinerator with Sydney’s letter I told you about (8). Oh! I shall fall through the earth next. I have just received Basil’s long epistle – & nearly banged my head through the back of the deck chair when I unrolled Champion’s mile long letter of such black writing but so neat. I had another letter too, it was from Cousin Muriel*. Have I to write in turn to such a windfall, such a gasping slap. I think you will think I am taking things to extreme but I shall have to write a letter to you all soon & will let it be just plain & serious, so you will forgive me for this my long letter. Oh! Basil dear Dodger. Oh! Mummy (Hush I saw your writing in Ida’s & read yours before her’s, – don’t tell her though) & Oh! Ida’s was a record for a Champion. Yes I will tell her of a Jock we call the ‘Scotch’. 32 beds in my Ward. Did you get my letter to you & Father in a green envelope dated Sunday 6th? Now you won’t lose any of the sheets as this last letter marked PS NB is important. This Letter clearly shows how important writing & receiving letters was to Pte Bertie Hibbett. In his heightened emotional state, in an agony not to break this ‘tie with Home‘, he adds Postcript after Postscript. (1) The Hospital Bag Fund (one of WW1’s many ‘morale boosting & practical schemes for soldiers’) was set up by Lady Smith-Dorrien 1881-1951 for the benefit of the sick and wounded in Hospitals and Casualty Clearing Stations. In <http://easttextile.co.uk/onewebmedia> Janette Bright 2015 writes that Volunteers produced an estimated 5,000,000 ‘Treasure Bags‘ to provide a store for a soldier’s personal treasures: papers, pay-sheets, photos & letters. Around 12″ x 14″ in size, made of strong material (flowered cretonne preferred) each had a drawstring and could be hung where a patient could easily reach it. Volunteers often added little gifts such as sachets of lavender and lucky charms. 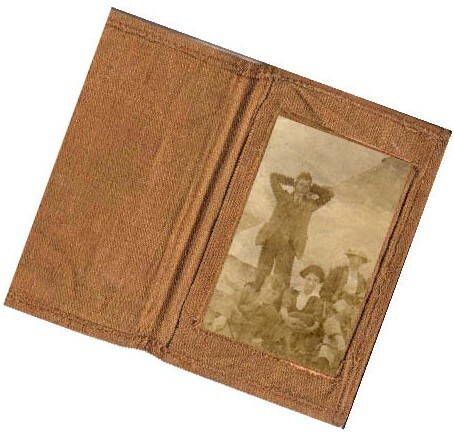 In Pte Bertie Hibbett’s case his ‘Lucky Bag‘ arrived with a little writing pad & envelopes and amongst his treasures would have been his Prayer Book – & the Bible given to each soldier by the Army. Sadly it did not prevent some of his letters being lost in the Steamer De-louser when, for a day or two, he was put back into khaki. 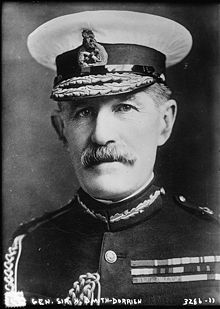 NB Lady Smith-Dorrien was the wife of General Horace Lockwood Smith-Dorrien who was relieved of command of 2nd Army in 1915 ‘by Lord French for requesting permission to retreat from the Ypres Salient to a more defensible position‘. Wikipedia. (2) Lord Cardigan. Letter 10th Aug. 1915. 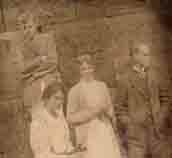 (3) Marie Neal Hibbett’s relatives/ close friends in Ashton? 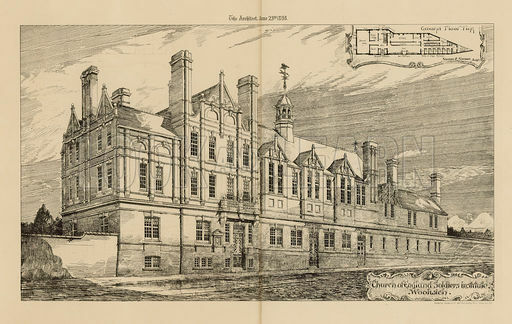 (4) Leicester Hospital. (5) Childhood Pickwick Club. Letter 23rd April & 7th Sept. 1915. (6) Sydney’s Club nickname. 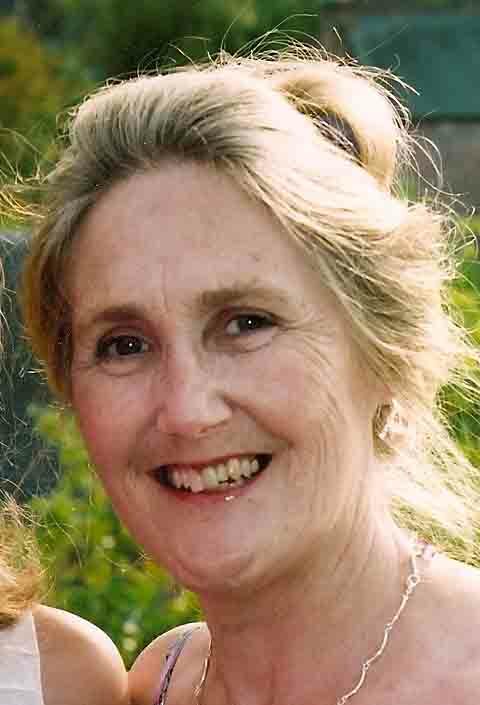 (7) Mary Overend. (8) Steam Disinfectant De-louser. Letter 7th Sept 1915. (9) Dickebusch: in parish of Ypres (Ieper). Divisional Rest Camp; notorious history of soldiers ‘Shot at Dawn’. CANADA HUTS NR DICKEBUSCH (9). NEXT POST: 14th Sept. 1915. General Horace Lockwood Smith-Dorrien.Green Envelope.John Bull Magazine.Lady Smith Dorrien President Blue Cross.Leicester Hospital.Lucky Bag Fund for Soldiers Ireland.Pickwick Club.